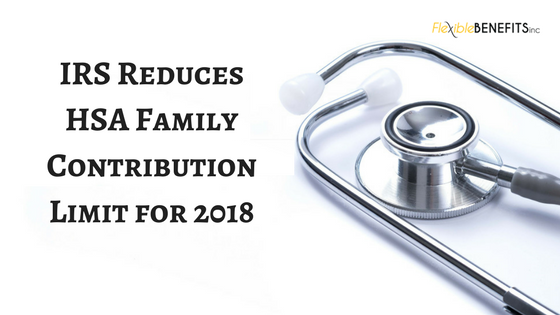 IRS Reduces HSA Family Contribution Limit for 2018 – Flexible Benefits Inc.
On Monday, March 5, 2018, the IRS announced that as a part of IRB-2018-10, there will be a revised Health Savings Account contribution limit. The revision comes as a part of the tax reform legislation that was passed at the beginning of this year. The new Health Savings Account contribution limit for individuals who are enrolled in family HDHP coverage has been reduced for 2018. The new limit is now $6,850, as opposed to the $6,900 family limit that was originally announced by the IRS in May 2017. For those who have self-coverage, they were not affected, and the limit remains at $3,450. This change is backdated to January 1, 2018, which means any prior contribution elections may be adjusted or excess contributions that have already been deposited for the year 2018 will have to be returned. What Other Benefits Were Changed? If you have other benefits like FSA, Dependent Care, HDHP deductible or out-of-pocket-limits, those were not impacted and will remain as they were prior to 2018. If you have any questions regarding business employee benefits, or of the recent change, Flexible Benefits, Inc. is here to answer them. Give us a call today and let us show you what using this great benefit can do for you and your staff. Contact us at (251) 237-1115 or toll-free at 1-888-821-9007.